This has to be one of the most beautiful ruined castles in the UK...a Royal castle with a violent history, still standing guard over a gap in the Purbeck hills between West Hill and Challow Hill. 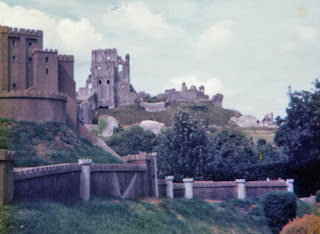 The photos here were all taken in the late 1970s on a number of holidays to Dorset, and incorporate the model village in the village of Corfe. The hill upon which the castle stands may well have served some defensive purpose for the Romans, who certainly had a presence in the area. Digs in the vicinity of the village have revealed Roman villas and communities. The first castle built here, probably constructed of wood, may have been erected in the 970s, around the time that Edward the Martyr (King of the English between 975 and 978)was assassinated. Post holes belonging to a large Saxon building have been excavated and are believed to have been the first building to occupy this prominent position. After the 1066 invasion by William and his forces from Normandy, Corfe was one of a number of South coast castles to be built to enable William to establish a power base from which his authority could be maintained. It is thought that the castle was partially constructed of stone, possibly indicating its high status. Above. Corfe Castle with the model in the foreground. During the reign of Henry I, the keep was developed (over a ten year period) until it stood to around the height of the ruins we see today. Purbeck limestone, quarried a number of miles away from Corfe, was used for the building, and by 1105, the keep was completed. By 1135, the castle was a formidable fortress, with an inner court surrounded by a high curtain wall with wall walks and a strong gatehouse. Above. View of one of the curtain wall towers from the bottom of the earthworks. For the next 45 years the castle was not developed or rebuilt in any major way, and Royal records show that only basic maintenance was carried out on the structure. In contrast, the Pipe Rolls produced between 1201 and 1204, show that over £750 was spent on rebuilding the West bailey's defences. Between 1212 and 1214, a further £500 was spent on improving the defences of the outer bailey. All in all, King John probably spent in total, somewhere in the region of £1400 improving and rebuilding the castle's defences. Above. Corfe Castle from the village of Corfe. In 1235 and 1236, Henry III spent around £1300 on the castle, with a large amount of this sum concentrated on improving the keep. Whilst this was being carried out, a small settlement grew outside the confines of the castle, housing all of the craftsmen and the work force employed in carrying out Henry's improvements. Such was the size of this new settlement, that it was eventually granted the rights to hold markets and fairs in 1247. 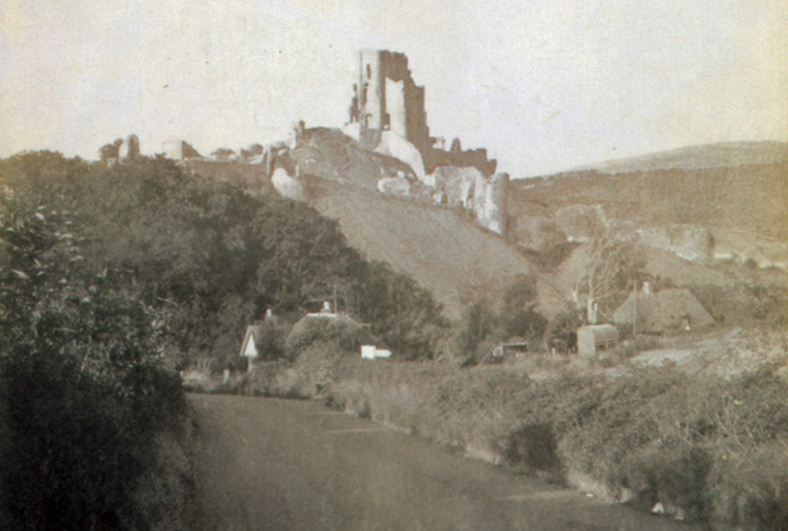 At this time, the keep was white washed, and must have presented a magnificent edifice to those approaching Corfe. Above. Another view of the model and real castles. Corfe remained an important Royal castle until it was sold by Elizabeth I in 1572, to the Lord Chancellor Sir Christopher Hatton. During this time, detailed plans of the castle were produced by Ralph Treswell (the castle's Steward), and these documents are the earliest known plans of the castle's layout. Corfe was eventually purchased by Sir John Bankes, who was the Attorney General to Charles I, in 1635. When the civil war broke out in 1642, Dorset was a predominantly Parliamentarian county. Corfe castle however, was held proudly for the King. 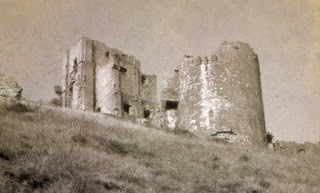 Lady Mary Bankes kept Corfe as her main residence, and she was initially successful in holding the castle against a long Parliamentarian siege, which lasted for six weeks. The besiegers numbered around six hundred men, whilst the garrison within the castle was little more than 80. 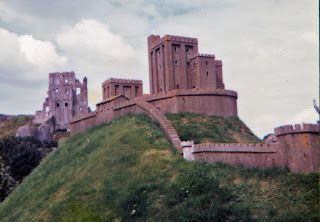 By the time a Royalist force had reached Corfe to see of the Parliamentarian forces, around one hundred men had died outside the castle walls, whilst Lady Bankes lost only two men. Unfortunately for Corfe, the Royalist cause did not fare well in the following year, and by 1645, it was one of a handful of castles still held for the King. The castle came under siege again in 1645, this time with a handful of Parliamentarian men managing to sneak within the walls. When the siege began for real, those soldiers hiding within the castle attacked the defending Royalist soldiers, causing the gates to be opened for the attacking forced. Corfe castle had fallen. Lady Bankes was taken prisoner and the garrison were allowed to leave unharmed. The same fate would not be granted to the castle itself, as Parliament ordered that the defences be slighted. The castle had been so well constructed though, that demolition proved an almost impossible task....so the walls, towers and gatehouse were blown up until they were in ruins. Above. The writer at the model village. Upon the Restoration of the Monarchy in 1660, the Bankes family were granted their former lands and properties. Corfe was, by now, in such a poor state that it would have been impracticable to rebuild it, so the family built a new pile at Kingston Lacey near Wimborne. 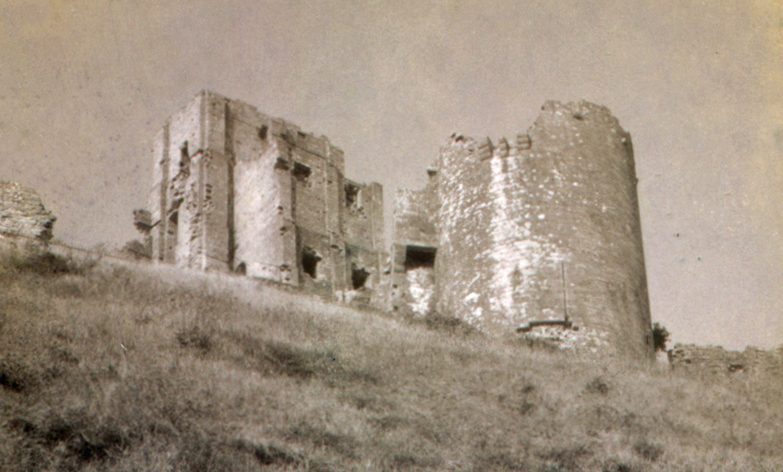 The castle underwent it's first archaeological survey in 1883, and was further explored in the 1950s, and then again between 1986 and 1997. Ralphe Bankes bequeathed the castle to the National Trust in the 1980s, and between 2006 and 2008, the most precarious parts of the castle were consolidated so that visitors to the site could explore the whole of the castle. Check this link out for some interesting information on Corfe Castle and Corfe village.